3/5/12 - The Emergency Action Trunk (E.A.T.) from J-Tech Gear is a huge rolling equipment bag. At 135L, it's large enough to hold more than most people can lift. It was originally designed as a deployment bag for military personnel but can be used as a 'hold everything' bag for avid shooters alike. The E.A.T. bag is more than a rolling duffle; it has much more organization than a simple duffle, to segregate and organize your gear. Eagle Industries Travel Rolling Equipment Cargo bag - with pockets (TREC-W/P), as its name describes, is a large rolling equipment bag. Okay, it's a huge rolling equipment bag. The concept of duffles or rolling luggage isn't anything new. Most duffles are simple huge 'bags' with a minimum of pockets (if any). Over the past couple of years, the 'loadout' or 'deployment' bag has entered the scene, evolving from the simple duffle into something offering more organization and versatility. 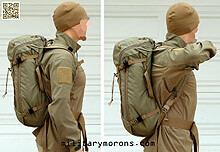 With body armour and sometimes the need to transport weapons, these loadout bags can become very heavy and unwieldy. Eagle's combined the loadout bag and rolling luggage concept into a package that makes hauling tactical gear around a whole lot easier. Besides being used for hauling gear and weapons, I can also see it being used for more mundane roles as a road trip bag for me and the wife to consolidate all our luggage into one. Overall design and features - The E.A.T. bag is made of 1000D nylon, and has both external and internal pockets. It has an internal hard shell backing at the bottom, as well as aluminum tubes to ensure that the bag doesn't collapse when fully loaded. A two-section handle at the top extends and retracts, for use when the E.A.T. is rolled along. The E.A.T. has a large main compartment with internal organization, and external pockets, also with organization. High-strength nylon wheels at the bottom corner allow the E.A.T. to roll, which are necessary for a bag this large and heavy when loaded. Overall dimensions - (max including pockets, approx, seam to seam) 41" long x 21" wide x 13" deep. Notes: I'm calling the two main external pockets the 'Rifle side' and 'Pistol side' to differentiate between the two sides, based on their internal pocket configuration. The first thing I did upon receiving the E.A.T. bag was cut off all the metal zipper pulls. Every time I moved the bag I sounded like Santa arriving in his sleigh, and while I don't have much need for stealth, I'd rather do without the jingling. So, I replaced them with 550 cord and ITW cord pulls. Hence, all the photos here have cord pulls instead of metal zipper pulls. Carry/Grab handles - There are a carry handle located at the middle of the bag and grab handles at each end made out of 2" wide webbing. Transparent document pockets - There are clear PVC document pockets located all over the bag - all of them have a velcro closure along one edge. The two pockets on the top of the lid measure 13" x 10" each. There's one on each end measuring 10" x 6". Another 10" x 6" clear pocket adorns the 'pistol side'. Retractable handle - At the handle end is a retractable handle for rolling the bag along on its wheels. It's a sturdy, comfortable handle made out of aluminum and plastic, with one main fault - it doesn't lock in the extended position. More on that later. Skids - Four plastic skids are riveted to the bottom of the bag, to protect the bottom. The bottom is reinforced internall with a hard shell backing, which provides the bag's shape. High strength modular wheels - there are three solid-feeling wheels at the bottom corner of the E.A.T. bag. The roll nicely and look like they have bearings. They're not 'modular' though, since they aren't removable or replaceable. Rifle side compartment - The rifle side compartment is on the side without the clear plastic document pocket on it. It measures 34" x 13" x 2", and is padded on the outside. It has a zipper closure. The compartment is large enough to accommodate a fully assembled 16" barreled M4 carbine (or any rifle under 35" overall length), as shown below. There's an internal pocket which measures 24" x 10" x 1.5". I can fit another upper receiver in there, or a lower receiver with stock. This pocket has a velcro-secured flap. To the right of the pocket are three SMG mag pouches with elastic retention, which can also be used for flashlights, pistol mags etc. Pistol side pocket - The 'pistol side' compartment is the same size as the rifle compartment: 34" x 13" x 2", so another rifle can be carried inside, if desired. It too is padded on the outside to protect the contents. There are two medium sizes pockets, which will hold a handgun each. They measure 8" x 6" x 1.75" and have velcro-secured flaps. I'm able to fit a Glock 17 with extended barrel, light and RMR in the pockets. There are also eight pistol magazine (or flashlight/tool) pouches with elastic retention. End pocket - The end pocket is located near the retracting handle, and measures 14" x 9" x 2". It's padded on the outside. Main compartment - The main compartment measures 40" x 15" x 13" (all are seam to seam lengths), for a volume of 7800 cu.in. It's pretty huge. The bottom of the compartment is lined with a sheet of nylon which can be folded back via a zipper. This exposes the hard plastic stiffening sheet and the square aluminum tubing stiffeners which house the retractable handle and prevent the bag from bending when being rolled along. Radio/equipment pouch - This is a large padded box-shaped pocket inside the main compartment at the handle end. I really like this, as it's suspended from the inside of the compartment, and is a perfect storage place for fragile equipment. I put my DSLR camera in there. It measures 12" x 7" x 5", and I'm able to fit a small ammo can in it, as illustrated below. Lid mesh pockets - Under the main compartment lid are three large mesh pockets with zippered openings. They each measure 11" x 10.5". Main compartment mesh pockets - Inside both sides of the main compartment are four mesh pockets, each measuring 12" x 9". They're pleated so they expand, and have zippered closures. Notes/Observations - This is the first time I've featured anything from J-Tech gear - due to the fact that I have limited time and little need for most of what they offer. J-Tech gear is made in Taiwan, and from what I can tell while perusing their website, reasonably priced for what you get. J-Tech also OEMs for other companies, which explains the TAC/TAG label inside the E.A.T. bag. The E.A.T. bag interested me because I have only one other similar type bag to compare it to - the Eagle TREC-W/P, which SKD Tactical used to carry and no longer does, it seems. Another reason is that the E.A.T. bag costs more than $100 less than the TREC-W/P, so I wanted to see if it would be a good lower priced substitute for it. The main difference between the E.A.T. and the Eagle TREC-W/P is that the TREC has a removable aluminum frame (which is purchased separately), and the E.A.T. does not. I wouldn't use the TREC without the frame as it just becomes a huge shapeless duffle bag (unless that's what you need). The TREC is also much lighter than the E.A.T. bag, due in part to the amount of pockets and padding that the E.A.T. bag has. The TREC doesn't have much organization, and no padding on the sides though. As I mentioned in the beginning, the E.A.T. bag is a monster (as is the Eagle TREC), and can be loaded up with more stuff that you can handle. With that much weight in it, manouvering the bag can be very cumbersome in confined areas. The large, luggage type wheels look durable enough, and roll very well. But, in case a bearing or wheel fails, they are not user replaceable. The one main complaint I have with the E.A.T. is that the retractable handle does not lock out. It doesn't seem that important until you actually load the bag up and try to manouver it up and down stairs, into a car etc. While the handle works perfectly for pulling the bag along, sometimes you need to use it to push the bag when 'driving' it. What happens when you push on the handle is that it collapses, and your fingers get scraped by the edge of the stiff nylon sheet backer, which is exposed in the handle recess. Another thing I wish the E.A.T. did was have the ability to stand on its end, on its own, like the Eagle TREC. Granted, it'd require that it didn't collapse at the bottom, and that some sort of frame would need to be added. But, I'd still like that ability. It's huge, so it takes up a lot of space anywhere you store it. If you lean it against a wall, it'll slide down or fall over unless you place something at the bottom to stop it rolling. This also becomes important if you're waiting in line with a bunch of people. Having to put it down and pick it up every few feet is annoying, and it takes up floor space. I'd sacrifice the ability to collapse it flat to have that stand-upright feature. Oh, and replace the metal zipper pulls with corded zipper pulls. That being said, I prefer the size and layout of the E.A.T. to the TREC. The side rifle and pistol compartments are great, and the E.A.T. provides a lot of organization for such a large bag. All this adds extra weight, but I think that it's worthit. I'd have ditched the SMG mag pouches in the rifle compartment and put a larger GP pocket there. Also, the grommets/drain holes at the bottom of every pistol mag pouch is unnecessary - they're covered, and have no where to drain since they're inside the pocket. I also don't have a need for clear document pockets on the outside of the bag - maybe one would suffice, and the others could be regular fabric instead of clear. Another thing I wouldn't mind seeing are compressions straps, like on the TREC - this would allow the load to be cinched down if the bag isn't filled to capacity. Compression straps would also support the weight of a rifle in the side pocket better. Compression straps could easily be made removable, for stowage inside a pocket. For the range, I normally carry three bags. A large Mystery Ranch duffle with my ammo, plate carrier, gear etc; my EMDOM TNT-EM bag with camera, pistols, water, FAK, smaller items; and my EMDOM TNT-GYM bag with my rifles (usually two rifles). It all weighs quite a bit. Instead of my three bags, I used the E.A.T. bag instead. The E.A.T. was easily able to accommodate everything but there are obviously pros and cons to consolidating it all into one bag. It's easier to roll one large bag, but it's harder to lift it in and out of a car trunk, since it can be loaded up so much. This is the same experience I had with the Eagle TREC bag, so it's not limited to the E.A.T. It's a tough call with the E.A.T. It's a good value at that price, and costs considerably less than comparable bags. Even so, I'd like to see two things change before I'd recommend it wholeheartedly - a lockout feature for the retractable handle, and the ability to stand upright unsupported. 8/27/12 - The Blade 15 pack from the Arc'teryx is a svelte travel backpack with laptop and accessory compartments. Like its bigger brother, the Blade 21 (unfortunately now discontinued), it's essentially an urban commuter backpack-style, messenger bag/briefcase/laptop case. Named for its volume (15L), it's a sleeker and more comfortable alternative to a laptop briefcase for people on the go. It's available in Black or Tungsten. 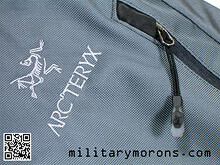 The Arc'teryx Blade 21 from their Law Enforcement and Armed Forces (LEAF) division was adapted from the civilian side as a 'staff bag for meat eaters'. It has unfortunately been discontinued, much to my disappointment, as I found it to be a very versatile, lightweight pack for everyday use. One of the things I liked about it was its internal organization. LEAF currently offers the Blade 24, which is a bit large for what I'd need for everyday use. The Blade 21 actually had more volume than I needed. So, when I was browsing the civilian side of Arc'teryx, I noticed the Blade 15. From the pictures on the website, it looked a bit small, but I thought I'd give it a try. Turns out that it can actually hold more than I assumed it could. Overall design and features - The Blade 15 is Arc'teryx's smallest Blade pack, with a capacity of 15 litres. Like the Blade 21, it's designed with attributes that I've come to associate with Arc'teryx's products - sleekness and spartan exterior design with hidden functionality. It's not covered in external pouches or PALS webbing, and has a very clean looking exterior. One of the more unusual features of the Blade packs is that their compartments open to the side - they're side-loading packs vs. the more conventional top or front loader. This design allows access to all the compartments without taking the pack off completely. All compartments can be accessed when the left shoulder is unslung, and the pack retained on the right shoulder and swung around to the front. There are no corners on the Blade 15; all corners are rounded and there are practically no right angles on the whole pack. It's very 'pod-like', and low profile. While the Blade 21 was more of a multi-purpose pack, the Blade 15 has laptop-specific features (more on that later), that aren't obvious from the outside. It just looks like a normal, slim backpack, but it's actually built solidly to protect the laptop inside. The Blade 15 also features a thermoformed back panel with removable HDPE frame sheet and 6061 aluminum stay. Overall dimensions (approximate) are width 12.5", height 19", thickness 5.5". For comparison, the Blade 21's approximate dimensions are width 11.5", height 18", thickness 7.5". The Blade 15 is slightly wider and taller than the 21, but not as deep. Overall construction is of 1260D Invista Ballistic Superpack nylon with 630D Invista HT Superpack nylon in certain areas. Advertised capacity is 915 cu in/15 L and weight is 2 lbs 4 oz (36 oz/ 1.02 kg). All compartments are lined with 210D Plain Weave nylon in a lighter colour for better visibility to aid in identifying contents. The Blade 15 is available in Black or Tungsten. I originally thought that Tungsten was the same shade as the Urban Wolf shade, used by the Arc'teryx LEAF line. It looked very similar on the computer screen. It's not the same. Tungsten is lighter in value and has a strong blue undertone. The photos below illustrate the difference between the two colours - I'm wearing the Arc'teryx LEAF Naga Hoody in Urban Wolf. Exterior features - The Blade 15 is padded on all sides with closed-cell foam except the side with the zippers, to protect its contents. The exterior is devoid of protruding pockets, buckles or flaps, which makes for clean, streamlined look of the Blade line. There's a tubular webbing grab handle on top, as well as one on the right side (when the pack is being worn). The padded, dual-density shoulder straps are contoured for comfort, and also slimmer than normal, at slightly over 2" wide. No sense in having too-wide shoulder straps for a pack designed to carry lighter weights. There's also no sternum strap; I didn't have any issues with the strap slipping off my shoulders. The shoulder strap pads are sewn with an internal seam - no seam tape is used. The underside of the shoulder pads are lined with a smooth, stretch woven fabric. Shoulder strap length is adjusted via ladder locs - there is no quick-release buckle. The webbing used is also narrower at 3/4" instead of 1". On the front of each shoulder strap is a hypalon strap that unsnaps at the top, intended for attaching cell/PDA/MP3 devices or carrying pouches. The Blade 15 has the same thermoformed back panel with embossed bird logo near the top as the 21. It's padded and covered in stretch woven fabric. I'm pretty impressed with the durability of this stretch woven fabric - I've been using the Blade 21 for 3 years now, and it shows no wear, even on the edges. I'd have expected to see a little pilling or wear, but don't see any at all. All the pockets/compartments on the Blade 15 are accessed from the right side of the pack. It was designed so that the pack can remain on the right shoulder, be swung around to the front, and all compartments accessed without having to set it down or take it off completely. Great when walking or on the move. All zipper pulls are metal with molded pulls and cord. Zipper pulls have molded zipper garages for protection when closed. Main/Laptop compartment - The main compartment measures 11" wide and 17.5" tall. The depth depends on what you have in the other compartments, but it's basically designed to fit a standard 15" laptop. The compartment is divided by a stiffened, padded 15" laptop holder, with elastic on either side to retain the laptop. A center web strap secures the laptop in the holder securely. The holder separates the main compartment into two sections, with the laptop between the holder and the back of the pack (protected by the thermoformed padding). Just out of curiosity, I decided to see if I could fit a 17" laptop in the main compartment. I couldn't fit it into the 15" laptop holder obviously (due to the side elastic straps), but I was able to shoe-horn it on the other side of the holder into0 the main compartment. The zipper would just close, but it closed. For reference, the laptop I tried in it was a Dell Inspiron 17" model 9300. Dimensions of the laptop: width 15.5", depth 11.3", thickness 1.7". If your laptop is even slightly larger, it's not going to fit. Frame sheet and stay - The HDPE frame sheet is removable via a zippered opening in the main compartment. The frame sheet gives the back of the pack its shape, and also insulates the user from hard objects (laptop) in the main compartment. Rather than an aluminum stay attached to the center of the frame sheet, the Blade 15 has a 6061 aluminum stay running along the right side of the pack, under the side grab handle. It provides rigidity and support for the pack; both when carried horizontally with a laptop inside, or worn vertically. Document compartment - The large document compartment is to the outside of the laptop compartment; just on the other side of the grab handle. It will accommodate any documents or books up to about 15" x 11". The main/laptop compartment and the large document compartment are separated by a nylon fabric divider, which is actually slightly oversize so that either compartment can expand into the other. You can therefore have two approximately equal-sized main compartments, or put everything into one compartment that's about 5"" deep in the middle (less on the sides where it's connected). This feature is great for segregating flat items, yet accommodates more bulky items like jackets. To illustrate what kind of bulkier items I could fit into the main compartment, I took the photo below with two standard small .30 cal ammo cans in the large document compartment. Accessory compartment/organizer - This is located on the front of the pack, and measures about 8" wide and 12" tall. It's meant to be accessed when the pack is on its side, like all the other compartments, so the slot pockets are naturally horizontal (when the pack is vertical). Inside are five slot pockets. From left to right, their widths are 5", 1.75", 1", 1" and 3". As shown in the photos below, I'm carrying a sunglass case, pens, multitool, small light and phone in the slot pockets. The pocket is roomy enough to hold additional items like small notebooks etc. There's also a key clip on a lanyard at the top. Security pocket - Located behind the thermoformed back panel at the back of the pack is a concealed security pocket, intended for passports, ID, boarding passes etc. It's accessed via a zippered opening on the left (when looking at the back panel). The zippered opening itself is 7" tall, but the pocket inside is taller than the opening. It's larger than I originally thought as it measures about 7" wide and 10" tall, and has hidden expansion pleats on the sides so it can accommodate items with some thickness. Of course, the first thing that came to mind was a handgun, so I gave it a try with my Glock 19. The G19 fit both vertically (with room to spare) and horizontally inside the pocket. I then tried a G17, and to my surprise it fit. It only fit vertically though, with the muzzle pointing down, and it's a snug fit. Not something you'd be able to draw in an instant, but defintely not difficult to extract. A full size 1911 also fit the pocket, muzzle down. The pocket is accessed just like the others - with the pack hanging from the right shoulder, it's swung around to the front. However, since this pocket is located lower down, I was also able to access it with the pack worn on my back with both shoulder straps on my shoulders, and draw my pistol. Observations and notes - The Blade 15 is only available from the civilian side of Arc'teryx; there's no LEAF version. Like the Blade 21, the Blade 15's streamlined profile and shape makes it suitable for travel, and the top and side handles make it easy to grab or retrieve from overhead bins or from under seats on planes. I had been using my Blade 21 for daily use, and sometimes found that it was larger than I needed. The Blade 15 is the perfect small pack for folks on the go, who don't want something too bulky. Like the Blade 21, the internal organization is what makes the Blade 15 so good for daily urban commuter use. It'll make one helluva bookbag. I've ridden my motorcycle with it (my other one, not the one that was totaled) and found it very stable even though it doesn't have a waist strap/belt or sternum strap. The shoulder strap are narrow and retain their contoured shape such that they stay on the shoulders without slipping off. For everyday, around town use, I think that a waist strap is unnecessary, and unless it can be removed or stowed, it usually just hangs down from the pack. So, in this particular design and what it was intended for, not having a waist belt is a plus. I tried a bit of jogging with it, and with the shoulder straps cinched up tight, there's very little bouncing. Although it isn't designed primarily for hiking, the Blade 15 (like the Blade 21) can also be used as a small daypack; a light jacket, water and snacks are easily carried in it. It doesn't have any port for a hydration tube though, but you can probably route it out the top of the main compartment. Like the Blade 21, the frame sheet in the Blade 15 prevents the sides of the panel from pulling away from the back when the pack is full, or has something bulky or oddly shaped in it. Some packs, when stuffed, tend to bulge out in the middle of the back, like a football. With the Blade 15, the back panel contour remains the same, and that's one of the reasons why it feels stable - it feels like it's hugging my back rather than just sitting on it. This also why it maintains it's low profile - it's probably one of the flattest packs I've worn, and doesn't get in the way when walking through a crowd. Combined with the aluminum stay on the side, the Blade 15 feels much more rigid and solid that you'd think for a small pack. It's definitely not soft or floppy, and the way it retains its shape helps when inserting items into the pack. If you want something smaller than the Blade 21 (now discontinued) or Blade 24, the Blade 15 is a great compact pack for the 'office on the go', general every day use or as a carry-on bag for travel. If a more streamlined look is what you prefer, rather than a pack covered in webbing and pockets, this might suit your needs. 4/19/13 - The Khard 30 pack from the Arc'teryx LEAF division made its debut at the 2013 SHOT Show, alongside with some others new packs in the LEAF lineup. In the past, many of LEAF's packs were Arc'teryx's civilian packs adapted to military/LE use; but this time, LEAF's new packs were designed from the ground up for military use. Overall description - At the 2013 SHOT Show, Arc'teryx LEAF debuted three new models to their lineup, with the Khard probably creating the most buzz. The Khard is named after a high mountain pass in the Himalayas; a nod to Arc'teryx LEAF's alpine roots of high performance mountaineering equipment. It's not a conventional top loader nor a panel loader, but is a fully padded single compartment pack that has a full U-zip closure that opens from the top, side or unzips completely to reveal interior panels lined with loop Velcro and daisy chains that allow the user to build their own modular system. Whether you're a photographer, communications specialist, mountaineer, medic etc., the Khard can be configured to your particular needs by the use of Velcro-compatible pouches and pockets (sold separately by other companies). The Khard is available in two sizes: 30L (1830 cu. in.) and 45L (2745 cu. in). The 30L Khard 30 is shown here. Both the Khard 30 and 45 are offered in premium quality low reflective air-textured 500D Cordura 6,6 balanced weave textiles with silicon in solid colours - Crocodile (pictured here) and Urban Wolf (grey); or 500D Crye MultiCam. With a capacity of approximately 30L, the Khard 30 is a medium sized assault pack that's build for light weight and comfort with an Arc'teryx C² (Composite Construction) suspension system that holds the pack close and tight to the body. Like most of Arc'teryx's designs, the Khard has a minimalist look to it with a streamlined exterior devoid of PALS webbing and bulky pockets. Removing the stowable bungee compression cord lacing in the front makes it look even more low profile. The Khard 30 weighs 49 oz (a little over 3 lbs). Approximate dimensions: Height 21". Width 13". Depth 9" at the bottom and 7" at the top. Exterior features - At first glance, the Khard 30 can look like just another medium sized commercial backpack (except for the colour); not unlike their Miura 35 in overall silhouette. Like the Miura 35, and other commerical packs, the Khard has two rows semi-vertical webbing just to the front of the main zippers, bartacked at 1.5" intervals to serve as attachment loops. The removable bungee (shock cord) is laced through these loops. The bungee can serve as a front compression cord, or for stowing a lightweight jacket on the outside of the pack. Rather than having a top-opening zipper only, or a upside-down U-shaped zipper in the front like on a panel loader, the Khard has an upside-down U zipper that wraps around the rear of the top, down the sides in front, then back to the rear of the pack at the bottom. This enables to pack to be opened up completely flat. While the overall silhouette of the Khard is quite straight from top to bottom, the main compartment has a taper, narrowing at the bottom. When the side pockets are full, they 'fill out' the bottom sides of the pack, so it looks straight. All of the Khard's exterior zippers are 'reverse' coil zippers so the coil is better protected and have cord pulls with molded plastic ends. At the top rear and sides of the pack, there are grab handles made of two layers of webbing - they're stiffer than most. Daisy chains - The Khard has micro daisy chains made out of .3" webbing on its exterior with bartacks every 1.5". There are two rows on top of the pack, and two rows on each side. The daisy chains can be used for hanging climbing equipment, carabiners, sandals, wet cloting etc. off the pack, or straps can be routed through them for lashing a sleeping pad or similar item. The bungee cord from the front of the pack can also be moved to the top of the pack or sides using these daisy chains. Shoulder straps - The shoulder straps are very low profile, lightly padded and anatomically shaped for comfort. They taper from 2.5" wide at the top to 1.75" near the bottom. A single daisy chain is sewn down the length of the shoulder strap, to which the removable Velcro one-wrap hydration tube retainers can be attached. At 20" in length, the shoulder straps are longer than normal, and on me reach almost all the way to the back when I snug them down. The removable sternum strap clips onto the daisy chain webbing, and can be moved up or down the shoulder strap to suit the user's preference. The sternum strap is 3/4" wide webbing and non-elastic. The shoulder straps have quick release buckles that can either be released conventionally by pressing the sides in, or by pulling down on the toggle that's attached by a cord. Pulling down on the toggle causes the spring arms on the male buckle to move inwards slightly, allowing the male buckle to detach from the female buckle. The toggle needs to be pulled straight down - a quick, firm tug is all that's needed. When doffing the pack, pulling forward on the toggle doesn't disengage the buckle; it just loosens the strap. The female buckle has a partial cover sewn over it. I believe that it's more for keeping the buckle oriented downwards for easy insertion of the male buckle, rather than as a protective cover. The Khard has a 2" wide waist/hip strap/belt to which removable thermoformed hip pods can be attached. Compression straps - There are two compression straps on each side, with Velcro One-Wrap keepers to manage the loose ends. The compression straps have side-release buckles to enable the user to open up the pack's panels quickly. The top compression straps originate from the back seam of the pack and connect to the female buckles sewn to the main panel. That way, some of the load is taken off the main zipper should the pack be stuffed full. The lower compression straps' female buckles are sewn to small 'wings' at the bottom of the pack, which are part of the front panel. They give it an appearance of having a beavertail panel, but they don't function as such. They provide additional protection and support for the contents at the bottom of the side pockets. External pockets - The 'large volume top pocket' is on the top of the pack, and actually wraps over the front and extends down to the top of the front 1" vertical webbing. It's roomy, hence it's name, and it'll hold much more than just a flat/slot pocket. It's accessed via the zippered opening near the rear of the pack, and has a key clip inside. There are side pockets on each side of the Khard, measuring about 19" tall and tapering from 6" at the top to about 8" at the bottom. They're designed to hold 100 oz/3L hydration bladders with narrow, tall profiles. However, I was able to fit a Source WXP 3L bladder in there, even though the top plastic closing slider was a tight fit at the top of the pocket. There's a hydration tube port at the top rear of each side pocket, right above the micro daisy chain. The main compartment of the pack also has hydration ports located just below the carry handle, which can also be used for radio antenna ports. Interior features - The Khard is padded on the top, bottom, front and side with .20" thick foam to protect its contents and lined with ripstop nylon fabric. The padding also provides structure for the pack, so that it retains its shape and doesn't collapse or flop around like a regular pack. The Khard allows acesss to the contents a few different ways. The main flap/panel can be opened partially, so that access is that of a top-loading pack. Each side panel can be opened individually for access to either side of the pack. Or, the main panel can be opened up completely so that the Khard is opened out flat. This provides multiple access points into the pack. Right inside the top of the main flap is an internal security pocket measuring about 10" wide and 7" tall. This is the only internal pocket built into the Khard. Velcro - This is one of the main features of the Khard pack. The interior of the Khard features loop velcro fields for attaching aftermarket velcro-compatible pouches for internal organization. The field on the inside of the main panel measures 18" x 4". The field on the back panel of the pack measures 9.5" x 4"; and the fields on the insides of the side panels measure 18" x 4". Frame sheet and stays - The Khard utilizes the "C² composite construction suspension system". It consists of a laminated, low profile frame sheet/back panel in combination with two 14mm aluminum stays. The frame sheet is contoured to match the curvature of the back, as are the aluminum stays, so that the Khard hugs the back of the wearer. The frame sheet is fused to the external bag and sewn in - it is not removable. It's semi-rigid, but will flex to follow the shape of the aluminum stays. The pack can be used without the stays as the high density polyethylene-based foam and closed cell foam maintains its shape and resists compression damage. The stays slide into their own individual sleeves and are removable. There are velcro-secured flaps at the top. The stays can be bent (within reason) to customize their fit to the wearer, but most users are probably going to be fine with their stock shape. Daisy chains are sewn down the length of the stay sleeves for strapping down radios or attaching equipment to. There's an additional daisy chain sewn horizontally across the top of the framesheet, and a hydration bladder hanger (plastic clip). Aftermarket Velcro Pockets - While Arc'teryx isn't making velcro-compatible pouches for the Khard series of packs, any aftermarket velcro-compatible pouch or accessory can be used in the Khard pack, as long as it fits of course. A couple of companies that are making accessories for the Khard are Blue Force Gear and LBX Tactical (shown here). Blue Force Gear's line of Dapper pouches will work with the Khard, and they're introducing Urban Wolf into their colour lineup to match Arc'teryx's colour. Parent company London Bridge Trading developed accessories specifically for the Khard with LBX producing them. The Khard-compatible lineup of accessories from LBX Tactical include various padded and unpadded pouches, mesh pouches, windowed pouches etc. Shown here are some examples of the Khard-compatible pouches from LBX. They're all made of light weight materials (since they're internal pouches), and have hook velcro on the back for attaching to the loop velcro fields in the Khard series of packs. The LBX pouches are available in Wolf (420 pack cloth), MultiCam (500D) and Tan 499 (500D). LBX-1012 Large padded pouch - This is a large padded accessory pouch with velcro flap closure. It has a draw string shroud top closure with cord lock. It measures 7.5" (width) x 8" (height) x 3" (depth) and weighs 3.5 oz. There's a full size slot pocket inside the rear of the pouch. The pouch is lightly padded with foam on all sides, including the top flap. I'd have liked a wider strip of loop velcro to be used for the flap closure instead of the thin 1/2" strip. As is, you have to line up the strip on the inside of the flap perfectly. If a 2" wide strip of velcro was used, you wouldn't have to line it up perfectly plus you'd have some ability to adjust the flap a bit (in case you have larger or smaller items in the pouch). This pouch is a perfect fit for my DSLR and lens. LBX-1015 Small window pouch - The small window pouch measures 5" x 4" x 3" (depth) and has a 3.5" x 2.5" transparent vinyl window on the top for quick ID of contents. It weighs 1 oz. The pouch has dual zippers with 550 cord pulls. At the ends of the zippers are small tabs to aid in closing the zippers. I'm able to fit size Glock 17 magazines in the pouch. The bottom of the pouch is covered completely in hook velcro. LBX-1016 Medium window pouch - The medium window pouch measures 7.5" x 5" x 3" (depth) and has the same 3.5" x 2.5" clear vinyl window on the flap. It's basically a larger version of the Small window pouch. It has dual zippers with 550 cord pulls. It will fit five 30-round M4 magazines (with no Magpuls or Ranger plates). The bottom of the pouch is covered completely in hook velcro. LBX-1021 Padded side pouch - The padded side pouch measures 18.25" x 4.5" (height) x 3.25' (depth), and is not only padded, but completely lined with loop velcro on the inside for securing items inside with additional velcro-backed accessories. It has dual zippers with 550 cord pulls and opens out completely flat. There are two mesh pockets on the outside of the pouch which will each fit a standard M4 30-round magazine. The padded side pouch is designed to attach to one of the Khard's side panels. When installed in the Khard, the pouch can be accessed without opening the entire pack; you can just unzip one of the side panel zippers, then the padded pouch. Shown below, I've illustrated the pouch with velcro pistol and magazine holders from my EMDOM TNT bag. It's a great size for spotting scopes. Also, the LBX small window pouches fit inside the padded side pouch, if you want even more organization inside. With velcro lined pouches, you can end up with a Matryoshka nesting doll situation with pouch within pouch within pack. LBX-1023 2-pocket side sleeve - This is a flat pocket measuring 18" x 5.25" and is about 1/8" thick. It has two mesh pockets, each measuring 9" x 5" with single zipper closures. Each pocket will just fit a standard 30-round M4 magazine. It's also available in a 3-pocket version with one of the pockets divided in two. The pouch is attached inside the Khard via the two 1" wide strips of hook velcro. I'd have spaced the strips 2" apart vs. 1" so that they support the pouch closer to the top and bottom. Observations and notes - While the Khard 30 (and its bigger brother, the Khard 45) can be used as a regular backpack/assault pack, it was designed as a modular platform to enable to user to carry and organize his gear using aftermarket velcro-compatible pouches. The fully padded, single main compartment may add a bit more weight vs. a non-padded pack, but the padding provides protection for the packs contents as well as structure to the pack to better support and carry internal pouches. I very much like the way that it retains its box shape and doesn't flop and collapse completely like a soft unstructured bag. It was designed with the breacher, medic and comm specialist in mind, but its use is most definitely not limited to those roles. The Khard is made overseas like many of LEAF's products, and exhibits the same build quality and attention to detail that the other products do. The advantage to having a pack with internal sewn-in pockets/organization is that it's going to be lighter than a modular system; however you're constrained to the fixed pocket and compartment layout. The key to keeping a modular system light weight is to have pouches that are designed for internal use and an attachment system that's easy to use. Packs with internal PALS webbing are modular, but without the right pouches, can be too heavy. Using regular molle pouches inside a pack for internal organization is less than optimal because in general, molle pouches designed for external use are overbuilt for internal use and weaving the molle straps or malice clips through internal pack webbing is slow for installation and removal. It also adds unnecessary bulk and weight. Velcro-lined packs work well, I've found, with the right pouches. The pouches are easily installed and removed, and if made lightweight enough, won't add too much weight to the pack. It's a smart thing that Arc'teryx LEAF did; to design a platform then collaborate with other companies for the design and manufacture of pouches specifically for the Khard pack. Velcro isn't as secure as PALS webbing, but when used internally, it doesn't have to be. The pouches just have to keep from moving inside the pack, and provide organization. The LBX pouches shown here are purpose-built for the Khard, and their construction reflects their intended use. They're not heavily built like pouches designed for external attachment, but are constructed of lightweight materials without reinforcement. In other words - perfect for the job. I'm thinking that they could even go with lighter weight materials, like some of the internal organizer pouches available in the commercial market. Inside the Khard pack itself, I'd have liked to have seen the velcro fields inside the main panel and framesheet extended all the way to the bottom of the pack. I asked LEAF why this wasn't done, and they explained that heavy items would need to be secured against the back panel, and the side panels have velcro that go all the way to the bottom, so there wasn't any need for velcro there as it'd only be accessible when the pack is completely 'flowered' open. That makes sense, but I don't think it'd have hurt to extend the velcro all the way down. That way, the padded side pouch could have been attached inside the main flap. As it is right now, it's possible to attach the padded side panel to the main flap, but the issue is that it's then required to bend at the top which doesn't work well when the pouch is fully loaded. The user will have to figure out which configuration of pouches fits his needs the best. I used the Khard as a range pack just to see how the velcro pouches worked to keep the contents organized, and it did so as intended. I mounted the Large padded pocket at the top of the framesheet with my DSLR in it, and the other pockets carrying my hearing and eye protection, ammunition, magazines etc. Handgun in the outer side pocket. It's not a big pack, so the contents didn't shift around at all, with the velcro pockets all containing items. While not quite as quick to access as a shoulder carry bag (like a range bag or TNT bag) that has access to all compartments and pockets from the top, but that's to be expected with multiple access points and a backpack configuration. A shoulder bag isn't going to be as comfortable for long term carry though. I kept the main compartment zippers at the top middle of the pack so they could be found and moved to open the pack from either side. I'd recommend keeping them there so you're not searching for your zipper pulls every time you need to open the pack. The Khard has a pretty streamlined overall profile, which I've found to be a common design trait of the Arc'teryx packs I've had. The exterior isn't 'busy' with pockets sticking out all over, and the external compartments are subtle and carry more than you'd expect them to. They have volume, but it's not achieved with a box shape, but by having the pocket panel material larger than the seam-seam measurements so there's room for expansion. As I mentioned earlier, the Khard's shoulder straps (the padded portion) are quite long, and I'm small enough such that I have them tightened all the way down. I'm assuming that the extra length is intended to allow the Khard to be worn over a plate carrier or gear. The sternum strap, on the other hand, is a bit short and could use a couple of extra inches. I'm not a barrel chested fellow, and I have the sternum strap at full extension. 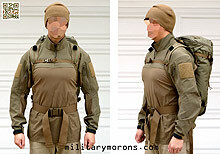 It may be a bit tight if you're a much larger guy or want to use it over a plate carrier. While the shoulder straps have minimal padding, I didn't find that to be a detriment to comfort as properly designed straps really don't require thick padding. They're wide and stiff enough to distribute loads quite well. The body-hugging contoured framesheet of the Khard is very comfortable. I didn't have to bend the stays to adjust them to my back. It follows the contour of the back better than the flatter framesheets of the Blade series of packs. The stays and framesheet perform a number of functions. They provide shape and support for the pack, and also provide a rigid platform for heavier items to be strapped to the webbing inside the pack which is part of the framesheet. This prevents heavier items from shifting inside. They also prevent off-shaped items from poking into your back, whereas a pack with padding and no framesheet might not do so. The contoured framesheet stabilizes the pack on the back and keeps it from bouncing up and down when trotting or when moving around (kneeling, bending down etc). If the load inside is strapped down and the pack is snugged to your back, it's going to feel very solid. This also reduces chafing on the lower back from pack movement. The waist belt is intended more for pack stability when snugged up, pulling the pack into the back, than to transfer weight to the hips, as the pack is not tall enough to provide any shoulder lift. My experimentation with the pack consisted of loading it up with a case of 5.56mm ammo - about 35 lbs. I think that 35-40lbs is about right for the Khard. More than that, and I'd want a suspension system that offloads some of the weight to the hips. At a hair over 3 lbs, the Khard is light enough to function as a regular daypack but will be more durable than the average lightweight civilian daypack made of lighter weight fabrics. Some folks may not need the additional protection for the contents that the Khard's padding provides, but it adds such little weight that the I feel it's worth the structure and shape that it provides to the pack. The Khard is not limited to the tactical or military user. With the growing variety of velcro pouches and pockets available, anyone can take advantage of the modularity of the system to customize the pack to their particular needs.